The Messenger of Allah (صل الله عليه و سلم) appointed first Zayd bin Harithah as the commander, Zayd (رضي الله عنه) was slained, then Jafar bin Abi Talib (رضي الله عنه) was appointed as a commander, he was slained too. After him Abdurrahman bin Al-Rawaaha, he too was slained, so the Messenger of Allah (صل الله عليه و سلم) finally deicided to make one of the best choices of his life, namely by chosing Khaled as the commander, and what an excellent choice that was. Khaled was able to maintain his heavily outnumbered army of 3,000 men against a massive army of 200,000 of the Byzantine Empire and Ghassanid Arabs in what would be known as the Battle of Mu’tah. Khaled bin Al-Waleed (رضي الله عنه) assumed command of the Muslim army at the crucial moment, and turned what would have been a bloody slaughter into a strategic retreat and saved the Muslim army from total annihilation. Did you know that from that day on the Prophet (صل الله عليه و سلم) never preferred ANYONE over Khaled (not even Ali Ibn Abi Talib!) and always chose Khaled as the commander of his army? This is a fact, it has got nothing to do with Shia or Sunni narrations, it’s an historical fact that shows how much the Prophet (صل الله عليه و سلم) appreciated Khaled and trusted him. […] Khaled bin Al-Waleed then took the banner, and he was not among the commanders, then the Messenger of Allah (peace and blessings be upon him) his finger and said: “Oh Allah, he (Khaled) is one of the swords from amongst your swords”. Thereupon the Muslim gained victory and from that day one Khaled was known as the Sword Of Allah (Sayfullah). Wahshi Ibn Harb narrated that when Abu Bakr Siddique (رضي الله عنه) handed over the banner to Khalid Ibn Walid (رضي الله عنه) to fight the apostates, he said, “I heard the Messenger of Allah (صلى الله عليه وسلم ) say, ‘Excellent is Allah’s slave and our brother, Khalid Ibn Walid, a sword of the swords of Allah that Allah has drawn from its scabbard against the kuffar and the Munafiqeen’. – Only a year (after the battle of Mu’tah) later in 630 AD, the Muslims advanced from Medina to conquer Mecca. In the Conquest of Mecca Khalid commanded one of the four Muslims armies (along with Ali bin Abi Talib) that entered Mecca from four different routes, and routed the Qurayshi cavalry. – Later that year, he participated in the Battle of Hunayn and the Siege of Ta’if. – He was part of the Tabuk campaign, and from there he was sent to Daumat-ul-Jandal where he fought and captured the Arab Prince of Daumat-ul-Jandal, forcing Daumat-ul-Jandal to submit. He then participated in the farewell Hajj. During which he is said to have collected a few hairs of the Messenger of Allah (permissible Tabarruk wich is permissible with the relics of the Prophets ONLY, and not with Peers, ‘Ayatollahs’ etc. ), believing that they would help him win his battles. And there are some more campaigns where the Messenger of Allah appointed Khaled as a commander he also appointed Khalid to lead a mission to destroy the Idol and temple of Al-Lat at Nakhlah, and as stated before the Prophet always relied on Khaled in did not prefer ANYONE over him as a commander. – The Ridda wars, were most Arabs (except the Sahaba in Madinah, Makka and Taif etc.) apostated after the death of the Prophet (most Arabs, not Sahaba as in the upside down world of the Rafidah), this was due to them REJECTING the OBLIGATION of Zakah to anyone but the Prophet, and since the Prophet demised they simply denied the obligation of Zakah to anyone else (this is the Kufr according to the consensus of the Muslims, because they did not just reject GIVING Zakah like many Fasiqs who do not give Zakah, rather they rejected the OBLIGATION, it’s like someone who says the daily prayer are NOT an obligation in Islam. This person has spoken disbelief, while the one who does not pray – but does not claim that the prayer is not an obligation – might be excused) so Abu Bakr decided to fight them, Ali supported Abu Bakr in this campaign and Khaled was one of Abu Bakr’s main advisers and an architect of the strategic planning of the Riddah wars. He was given the command over the strongest Muslim army and was sent towards central Arabia, the most strategically sensitive area where the most powerful rebel tribes resided. There Khaled killed the MURTADD apostate Malik bin Al-Nuwayrah whom the Rafidah venerate and call a ‘true Sahabi’ whilst accusing Khaled of having shed Malik’s blood unjustly (refutation HERE)! Yes, this is the reality of this disgusting Rafidi cult. Fireworshippers (Abu Lo’lo’a Al Majoosi), sons of much lower status then their father (Muhammad bin Abi Bakr رحمه الله) and even APOSTATES (Malek bin Al-Nuwayhra) turn into the GREATEST ‘SAHABA’ whereas the great Sahaba (Omar cowardly murdered DURING prayer by a Shia saint Majoosi/Zoroastrian suicide), Abu Bakr (who is way more superior to his son Muhammad according to PLENTY of authentic narrations) and Khaled bin Al-Waleed (who saved the blood of thousands of Muslims, including the Prophet) are condemned as Kafirs, apostated criminals. The truth is, Rawafid, the enemies of Islam, love to raise the status of EVERYONE just to make the Sahaba look bad. Malik bin Al-Nuwayra (at least learn his name properly) was a known Zakah refuser and on top of it he prevented his people to give Zakah to the Khalifa of Rasul Allah Abu Bakr (SAWS). It was said that Khaalid summoned Malik ibn Nuwayrah, and warned him against following Sajjaah and withholding zakaah. He said: Do you not know that it is the partner of prayer? Malik said: Your companion used to say that. He said: Is he our companion and not yours? O Diraar, strike his neck. So I struck his neck. End quote. In any case, some Sahaba critisised Khaled decision because the stance of Malik was ambigious (there are different narrations), so the worse the Rafidah can accuse Khaled of is having killed an (apparent) Zakah denier (maybe he wasn’t) in rush. Based on this they want to strip him of all his merits (remember the Sahih Ahadith mentioned before), all his victories and all the LIFES of the Muslim (including the Messenger of Allah) he saved! The Rafidah based on some mistakes of a military commander like Khaled, side with the orientalist Kuffar and slander Khaled and claim that due to him the image of Islam has been tarnished! Allahu Akbar! So misjudgements of Khaled that where corrected by the Prophet HIMSELF or other Sahaba ‘tarnish the image of Islam’? How dishonest and hateful can these people be? Full of grudge indeed. Khaled was not an infallible, he did his utmost to serve Islam (as you can see), and hence the Prophet nor ANY of the Sahaba every stripped him of all his merits, let alone calling him a ‘bloodthirsy murderer and enemey of Islam’, as the Rafidah (along with the orientalst Kuffar!) do! Anway, here a detailed refutation>>>. This is something most mostly today are unaware of, namely that Khaled played a key-role in the battle against one of the spawns of the Rafidah, namely the Sassanid-Majoosi empire. Khalid was sent (by Abu Bakr) to the Persian Empire with an army consisting of 18,000 volunteers against the Sassanid forces (that included Arab Christians and Majoosi/Zoroastrian Arabs!) who in fact started the war years ago by attempting to kill the Messenger of Allah (صل الله علیه و سلم). The Sassanid Majoos (just like Iran today) where aggressive polytheists who were realising that the Muslims were becoming stronger and stronger and hence the Muslims had no choice but to plan or pre-emptive attacks to secure more territory to create a buffer zone between the Islamic state and the powerful Sassanid and Byzantine empires. Khalid told his representatives in Iraq to be good and kind to the Iraqis. The Iraqis became fond of the Muslims because they weren’t used to justice and kindness from the Persians. They welcomed Muslims as liberators. He won quick victories in four consecutive battles and basically defeated the whole Persian army in the province of Iraq that was occupied by the Persians. He was eager to fight at Qadisiyyah, but Abu Bakr sent him to encounter another powerful enemy, this time the Eastern Roman Empire, back than the Levant (Sham) territories that were occupied by the Romans. Abu Ubaidah ibn al-Jarrah (the Amin of the Ummah, as the Prophet said), the chief commander of the Syrian front, requested reinforcements from Abu Bakr al-Siddique. The latter responded by sending reinforcements led by Khalid. Khalid fought alot more battles, such as the battle of Yarmouk, Campaigns in Armenia and Anatolia. Over 50 victorious battles that he commanded without defeat (not including small battles, altogheter around a hundred battles, including single duels). 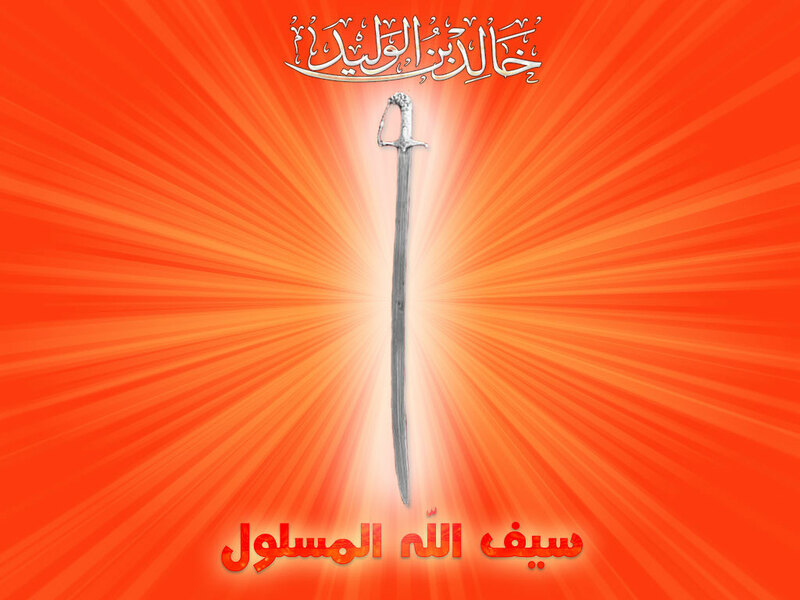 […’] one of the swords of Allaah took the banner, until Allaah granted them victory.” (Narrated by al-Bukhaari – 4262). Khaled had become a trial of disbelief (because of his undefeated wars) for the Muslims as they had attributed the wins of battles to the personality and figure of Khaled; Omar the wise was reported as saying (when he relieved Khaled from supreme command of Muslim Forces and appointed Abu Ubaidah ibn al-Jarrah as the new commander in chief of the Islamic army):”I did not fire Khaled ibn al Waleed because I am angry with him or because of betrayal of trust or responsibility but the reason was just that I wanted people to know that it is Allah who gives victory”. This is how much Khaled had helped the Muslim cause, that Omar feared that people will fall into Ghuluww (extremism) with him. The Bangladesh Navy’s frigate BNS Khalid Bin Walid is named after him. Kazi Nazrul Islam wrote a popular poem named “Khaled” while he was suffering from malaria, showing his respect to Khaled and grief for his colonized countrymen. The troops sent by the Pakistan Army in the Gulf War in Operation Desert Storm was named “Khalid Bin Walid Independent Armoured Brigade Group.” It has been in active service in Saudi Arabia since. He was indeed a sword of Allah, an unsheathed one to be precise. He had shortcomings and made mistakes, all of us have, but truly, only the enemies of Islam can come to the conclusion that because of the mistakes he had done, his achievements, victories for Islam and merits are all worth nothing. Only the orientalists and those who fed them (although not al of them, for even many of his foes gave him credit for his in-matchable bravery and molten heart), the Rafidah can come to such conclusions full of grudge and enmity, but as we told you at the beginning, the Rafidah, the spawns of the Sassanid Majoos hate most Sahabas anyway, especially those Sahaba who participated in the opening (Fath) of Persia and freed the Persians of the oppression of the Sassanids and brought Islam to Persia. This entry was posted in - Khaled bin Al-Waleed (سيف الله), Defence of Companions (general) by Gift2Shias. Bookmark the permalink. akhi can i use this artical and other you articals (translated in urdu ) on my urdu site with your name ? Sure bro, go ahead (but check the article later on, we might make some changes, adding some Ahadith). Malik also wrote a treaty with the false prophetess Sajjah.